(4) Figures to the right indicate full marks. 1(a) Explain wire frame modeling, surface modeling and solid modeling. 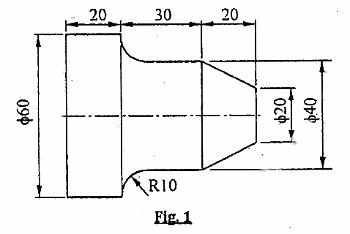 (10 marks) 1(b) Write a manual part programa for finishing a forged component as shown in Fig.1. Assume the spindle speed and feed for machining as 500 rpm and 0.3 mm/rev respectively. (10 marks) 2(a) A Hermite cubic spline is defined by points (1,1) and (6,5), having tangent vectors as (0,4) and (4,0) respectively. Find the co-ordinates of parametric mid-point and slope at the same point. (10 marks) 2(b) Explain AS/RS and their types. (10 marks) 3(a) Find the transformed co-ordinates of a triangle A (50,20), B(110,20) and C(80,60), if it is reflected about; i) X-axis and ii) Line y = x. (10 marks) 3(b) Explain the nature and role of CIM elements. (10 marks) 4(a) Find the transformation matrix ehich aligns vector K along positive z-axis with vector V = aI + bJ + cK. (10 marks) 4(b) Explain the major steps involved in rapid prototyping, list the various rapid prototyping technologies and explain Stereo-lithography in detail. 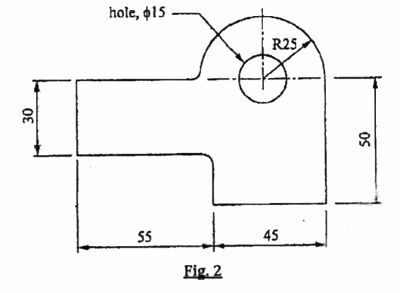 (10 marks) 5(a) Write a complete APT part program to machine the outline of the geometry and drill a hole as shown in Fig.2. The component is 5 mm thick. The end mill used is 10 mm in diameter and suitable drill. Assume suitable speed and feed for machining.